One Ocean Expeditions' 2016-17 Antarctic season includes two South Georgia In-Depth trips featuring on board Photography Symposiums that will appeal to amateur photographers and lovers of remote small-ship adventure cruises alike. Both expeditions include incredible wildlife encounters, fascinating history and truly breath-taking scenery. Plus, with up to 10 consecutive days of exploration in South Georgia, witnessing what has often been described as the 'greatest wildlife show on earth', it's the chance to spend more than double the time traditionally allocated to this seldom-visited area on longer trips to Antarctica. For those travelling in October 2016 (15th-31st) the departure has been timed perfectly to coincide with the intense spring wildlife activity in Antarctica. Guests will see king penguins by the hundreds of thousands, elephant seals fighting for territory to mate with their harems, fur seals mating, pupping and clustering the beaches, as well as a profusion of seabirds from albatross to giant petrels and skuas. In addition, following OOE's inaugural Shackleton Crossing in October 2015 in conjunction with the New Zealand Heritage Trust, particularly intrepid passengers will have an amazing opportunity to repeat Sir Ernest Shackleton's famous journey across the spine of South Georgia in 2016. Using skis, the crossing from King Haakon Bay to Stromness will take place one hundred years after the famous explorer completed the original journey. The January 2017 voyage (28th Jan – 11th Feb) takes place during the height of the polar summer when wildlife is at its most relaxed. Daylight hours are longer, penguin chicks are playful, fur seal pups are especially curious and a plethora of sea birds including wandering albatross, giant petrels and smaller cape petrels fills the skies. Not to mention staggering numbers of king penguins, particularly on the black sand beaches and tussock covered dunes of Salisbury Plain. On both expeditions five professionals will share their expertise in photographing and recording the wildlife and landscapes. They have all been selected for their exceptional ability to prioritise excursions in order to maximise the light for photography, whilst also managing weather conditions and itinerary commitments. Leading the group will be award-winning photographer and conservationist, Daisy Gilardini, who has visited Antarctica and the sub-Antarctic Islands every year for the past 19 years. Daisy combines her skills as a photographer and love of extreme adventure with a true passion for the natural world and a life-long commitment to the environment and conservation issues. She comments: "As environmental photographers, it is our duty to capture the beauty of places and species at risk and to raise awareness through the images that we capture. Going back to the same places in different seasons is one of the most rewarding experiences for a photographer. South Georgia holds a very special place in my heart. It is overwhelming for the breath-taking beauty of the landscape as well as the huge amount of wildlife you can find there." Joining Daisy will be Martin Hartley, one of the world's leading expedition and adventure travel photographers, who has 20 unique polar assignments to his name; Ron Clifford, an artist, coach and creative mentor who is well-versed in sharing his photographic skills, teaching field techniques and hosting workshops; Gerhard 'Guts' Swanepoel, who has earned his reputation as one of the most sought-after guides of his generation following 13 years of guiding and a staggering 1.2 million kilometres travelling across Southern Africa; and Canadian artist, David McEown, who has focused his work on the polar regions for the past decade, witnessing and recording the beauty of a world that is changing rapidly as it disappears. The 16-night departure on 15 October 2016 costs from US $10,395 per person based on triple share accommodation on board the purpose built and upgraded cruise ship, Akademik Sergey Vavilov, while the 14-night departure on 28 January starts at US $13,395pp. 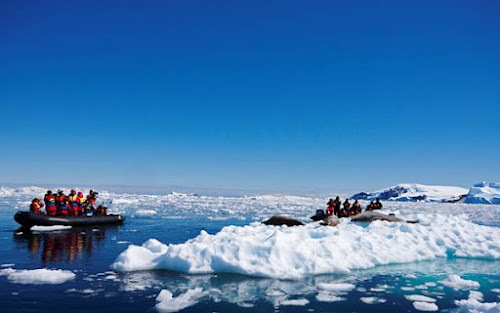 Prices include return flights between Punta Arenas in Chile and Stanley in the Falkland Islands, airport transfers, accommodation and meals on board, plus guides, wet weather gear, excursions and activities as included in each itinerary. Interactive workshops, one-on-one reviews and constructive feedback to help improve photographic skills, as well as dedicated photographic excursions, to take advantage of the light and extended periods on shore to satisfy the photographic time required are also included. An Antarctic Early Bird offer from OOE gives a US $1000 travel credit on all 2016/17 season bookings made before 1 December 2015.